While we have seen many Chinese handset makers populating the smartphone market, popular beverage company Pepsi seems to be joining the league soon. According to sources, Pepsi would soon be entering the smartphone market with a new smartphone. While it did seem far-fetched initially, the company has officially confirmed the reports but revealed that the company wouldn’t be actually making the phone but instead only licensing its brand to a smartphone maker. More importantly, the phone would be exclusive to China only. 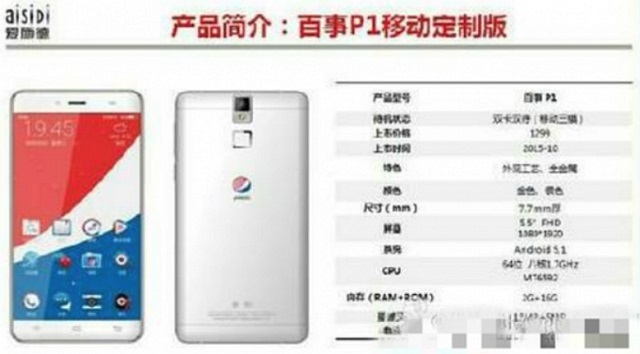 While Pepsi did not divulge any other details, sources reveal that the handset would be called as Pepsi P1 and would be a mid-range Android handset. The device is said to have a 5.5 inch full HD display and is expected to be powered by the MediaTek MT6592 chipset with 2 GB of RAM and 16 GB of storage. Interestingly, the phone is expected to be unveiled early next week (October 20 apparently).